When will be We Are the Joneses next episode air date? Is We Are the Joneses renewed or cancelled? Where to countdown We Are the Joneses air dates? Is We Are the Joneses worth watching? 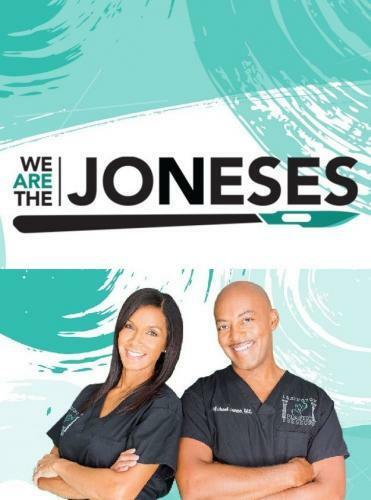 In We Are the Joneses, plastic surgeon Dr. Michael Jones and his wife, journalist and multi-media mogul Cathleen Trigg-Jones are helping people change their lives, both inside and out, all while building a global brand and raising a family! Two sisters call on Dr. Ende for matching facelifts and a lost wedding ring; Cathleen preps for her Chic Chat launch with a Girls' Night In. A tummy tuck gives a patient confidence to face her painful past; an augmentation plan leads to a health scare. A transgendered woman needs to fix botched silicone injections; Cathleen builds a green screen studio; it's round two of corrective surgery for the patient with giant facial keloids. Dr. Jones's extreme keloid patient must endure round two of a life-changing surgery; Cathleen asks Dr. Jones to compose the Chic Chat theme song in time for the website launch party. We Are the Joneses next episode air date provides TVMaze for you. EpisoDate.com is your TV show guide to Countdown We Are the Joneses Episode Air Dates and to stay in touch with We Are the Joneses next episode Air Date and your others favorite TV Shows. Add the shows you like to a "Watchlist" and let the site take it from there.